As mentioned in Article 7 on bodywork, Jim Mokwa had his GTO's body professionally repaired by old-time body man Leo Coonen of Waupaca, Wis. Even though Jim had used Leo to fix other cars, he admits that the cost on the Resto-Mod GTO ran higher than he expected. Jeff Noll saved some money by doing the bodywork on his Camaro by himself. 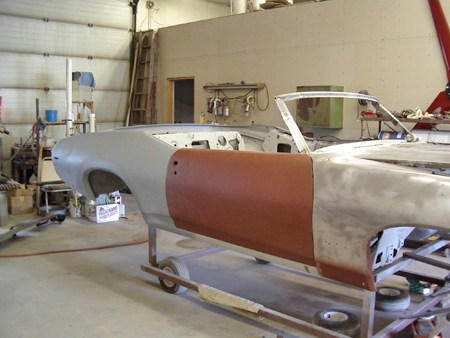 Each panel on Jeff's car was primed, sanded and re-primed before Jeff started his final preparation for paint. 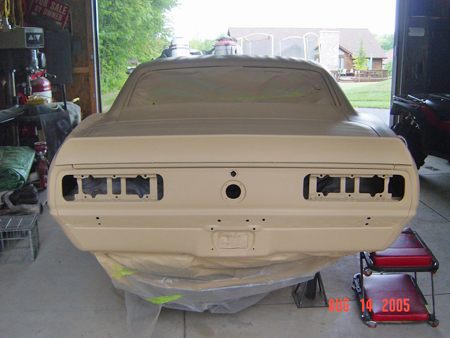 Each panel on Jeff's Camaro was primed, sanded and re-primed before Jeff started his final preparation for paint. Primers are spray on or brush on coatings that are applied directly over unfinished metal (or over fiberglass or metal body fillers). There are different types of primers, each intended for different purposes. Primers are not made to serve as a topcoat, such as a paint or powder coat. They are meant to be used only to prepare the surface that is going to be painted to accept the paint. Resto-Mod builders will find themselves dealing mainly with three types of primers: 1) Epoxy primers; 2) primer-surfacers (also known as primer-fillers) and sealers. 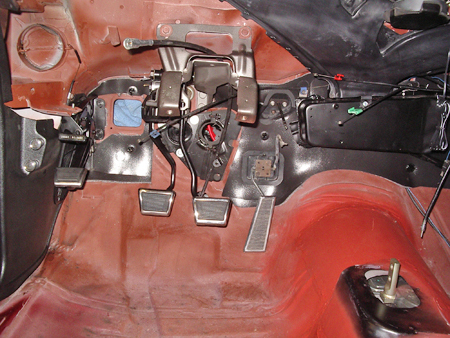 Primers spray or brush on directly over unfinished metal, like the new floor in Jim Mokwa's GTO, to protect it from rust. Waterproof epoxy primers serve to protect bare metal from the process of oxidation. You mix these products with an activator that starts a hardening process over a certain period of time. Each product has its own "window" of time in which you can spray it on the car before it hardens. Because the epoxy primers are waterproof, they'll protect the bare metal from rust. In addition, they are formulated to help the new paint that you'll put on over them adhere better to the metal. In most cases, the epoxy primer will be a part of the paint system you purchase and will be a product of the company that manufactured your paint. Usually, you'll be applying one or two coats of epoxy primer during your builds. The rear floor and both the horizontal and vertical underseat areas in the GTO ragtop's rear passenger compartment were prime coated. Most Resto-Mods are build from older muscle cars on which sheet metal made in the '60s or '70s has been repaired to one degree or another. Even when expertly completed, such repairs often leave very minor signs of filing, sanding, hammering and riveting. Primer-surfacers are used to "hide the evidence" of body repairs. These undercoats are blended with a high enough level of solid pigments to fill in the microscopic scratches and pinholes to provide an exceptionally smooth surface for the final topcoat (or paint) to be applied over. Correctly-applied primer-surfacers can fill in flaws up to 1/4-inch deep. Jeff Noll used these products on the new rear quarter panels he welded onto his car. When used according to instructions, primer-surfacers will fill in flaws that are up to 1/4-inch deep. They do not replace the use of body filler that is used for heavier repairs. The primer-surfacers are not strong enough to fill areas larger than those they are designed to fix. However, they are one of the keys to a perfect paint job, since the final topcoat serves to emphasize what's below it. Primer-surfacers are designed to be sanded to the 10th degree. When you apply them, do it with the utmost care and evenness. When you sand these products, do it smoothly and slowly using high grits of sandpaper only. Also, keep the primer-surfacers from getting wet, as some of them are not as water-resistant as others. The last thing you want to do is get moisture into a porous primer-surfacer where it will cause problems underneath the paint that you apply over it. After applying the first coat of primer-surfacer and allowing proper curing time, the entire car will have to be sanded with a medium-smooth sandpaper such as 150-grit. Then, after you sand the car completely and blow or wipe off all the sanding dust, you'll spray on a second coat of your primer-surfacer and let it cure again. The second coat will then be sanded at least twice, each time with increasingly finer grit sandpaperâ€”perhaps 320- and then finally 600-grit. A darker color paint or primer can be applied as a guide coat for your sanding. When the two colors become one you'll get a smoother surface. A darker color paint or primer can be applied as a guide coat for your sanding. The darker color will settle mostly into lower areas and as you sand the higher areas, only the guide coat will show after awhile. As you continue to block sand the darker color will be removed from the high spots as you knock them down. As less and less of the darker color shows, it means the high spots and low spots are evening out. You're making the overall body surface smoother. Most resto-Mod builders understand the roles that primer and paint play in refinishing a car, but don't know as much about the importance of paint sealer products. Paint sealers act to form a barrier between the primer undercoat and the paint topcoat. They often add the extra something you need to turn an average paint job into a really great one that pops. The sealer protects the undercoat from the chemicals and solvents in the paint applied over it. They give the topcoats better adhesion and also promote more uniform color matches. Whenever you're painting over an existing painted surface, you should use a sealer for sure. With most Resto-Mods you'll have no idea what type of paint the factory or a previous owner applied. The use of a sealer will keep your new paint from being damaged by the materials existing in the old paint. Sealers usually do not require sanding, unless imperfections develop when you apply them. If this happens, the fix is to use a fine sandpaper to smooth the problem areas before doing touch-up with a new topcoat. Sealers should also be used over baked-on factory finishes that were done at temperatures around 450 degrees. Such finishes tend to be so hard and durable that new paint can't adhere well to them unless they are sealed..
After finishing sheet metal fabrication and body work, you'll begin to prime the car one panel at a time. You may use one color over another as you go. 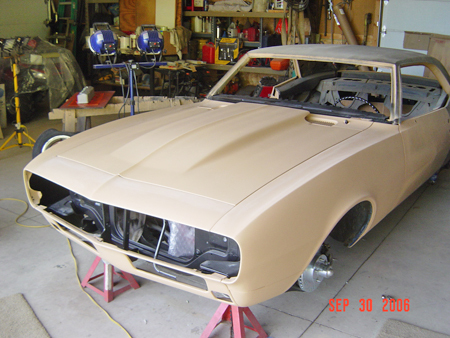 The product Jeff Noll used for priming the body of his Camaro is Dupont's URO Primer-Filler. To put it on the car, Jeff used a Vapar HVLP spray gun kit with two large guns and one small gun. He purchased the entire kit from Northern Tool for $130 and it did a fine job of putting an excellent finish on the car..
HVLP guns are gravity-fed units that use up less paint because they operate at low air pressure. This reduces the amount of paint sprayed and reduces overspray. To work properly, HVLP guns require that the material valve, air pressure and spray gauge be properly adjusted prior to spraying any paint. Jeff screwed the air pressure regulator to the bottom of gun's handle, before plugging it into his air supply. He used the compressor in his garage for air and set the pressure regulator to a setting between 15 and 25-psi. Then, he adjusted the nozzle to dial-in the proper spray pattern width (wider for wider panel, etc.). The material valve moves up for less, down for more paint. Experts say that there should be sufficient flow for a nice smooth pass to cover the panel with a nice coat of paint. Use even side-to-side strokes to check adjustments. Always hold the gun tip of parallel to the painted surface to prevent paint buildup. Paint sprayed directly on a metal surface would soon peel off again. That's why primer is used. It adheres to metal and paint sticks to it. After you have done work on a car's body panel, a primer coat seals it from air that could cause rust. Some primers also fill in sanding scratches and similar minor imperfections. There are two basic types of automotive primers used today: single-stage acrylic lacquer primer and two-stage urethane primer. The single-stage type is easy to use. You just strain it and spray it using a 1.4 spray gun tip. Each coat is smoothened with 600-grit sandpaper and up to three coats is applied. 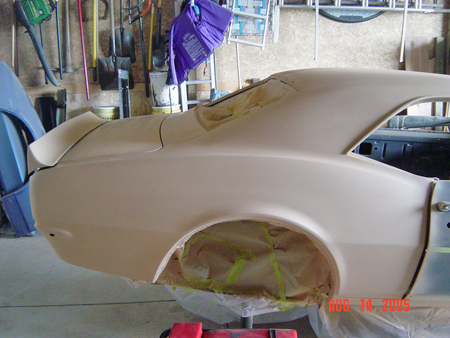 The URO used on the Camaro is a two-part urethane high-build primer-filler with good topcoat holdout. It's handy for spot, panel and overall applications. Jeff Noll's URO is a two-part urethane high-build primer-filler that provides good topcoat holdout. It is designed for spot, panel and overall applications. Urethane primer provides better adhesion characteristics and includes a catalyst or activator to make it harder for added durability. A 2.0 spray-gun tip is recommended to spray urethanes. The larger tip allows more paint to be applied. Three coats are normal, with 10 minutes dry time between each one. After the final coat, let the primer dry overnight before block sanding with 600-grit paper. Different color primers are available. 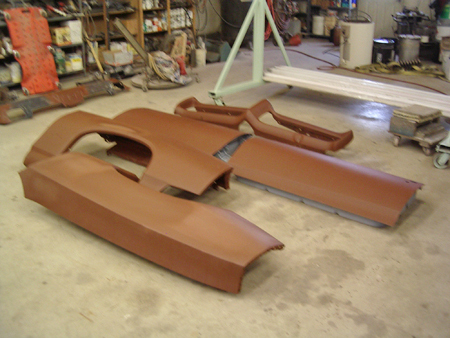 Leo Coonan used red oxide primer on many of Jim's individual GTO parts like the doors, fenders and grille surround. Automotive primers come in a range of hues. Jeff used the beige color that DuPont offers, since he was planning to paint the car orange. The more common light gray color is also available. 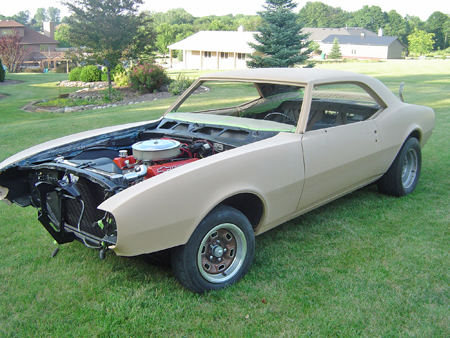 Some Resto-Mod builders say that darker colored primers show the straightness of a car body's feature lines better. The paint rep at any auto body supply store will help you make the right choices. You cannot give your Resto-Mod a quality paint job without properly preparing each painted part of the car, large or small, for new finish. 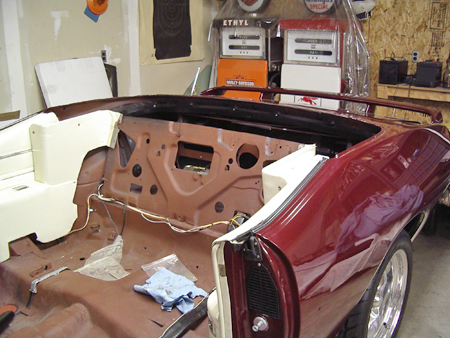 You cannot give your Resto-Mod a quality paint job without properly preparing the body surfaces for paint. Paint does not fill in defects in bodywork. In fact, it will actually make defects like cracks, crevices and surface irregularities stand out more than they normally do. Sanding body panels as perfectly smooth as possible is the only way to prepare them for paint. This is the type of work that anyone can do, but not everyone can do it the right way. Having a great amount of patience is very important to do proper sanding. Knowledge counts a lot, too. You have to know when you are doing it right and when you are done. Amateurs often sand for what seems like forever and achieve very little real smoothness. Your supplies and tools count a great deal, too. You rarely get good results trying to smooth imperfections with sandpaper that is either cheap or of the wrong grit for the work you're doing. Old, curled-up sandpaper will not work well, either. A good quality sanding block will work wonders and there are certain power tools that can really improve your sanding skills if you invest in good ones. However, you can do a good job without power toolsâ€”it will just take longer. After you have finished any sheet metal repairs with cutting, welding and filling, you can start sanding sand the repaired area. Some books will recommend six sandpaper gritsâ€”80, 180, 220, 320 400 and 600â€”but many professional Resto-Mod builders actually use fewer different sandpaper grits so they get by with less paper and control their investment in time and materials. Most of the pros will start with 80-grit, then switch to 180, then go to 240, 320, 400 and 600. For a super fine finish, they will use 1,000-1,200-grit sandpaper. At a recent seminar that we attended during the Hot Rod & Restoration Show in Indianapolis, Meguiar's demonstrated a new 3,000-grit paper it has for polishing. Most builders will sand by hand with the sandpaper on a plastic block. It's a good idea to set up separate blocks with each of the grits you'll be using and have them on the bench in front of you, along with rolls of each sandpaper. Use body work to fix the any really low spots before you start sanding. Trying to sand them away takes longer. 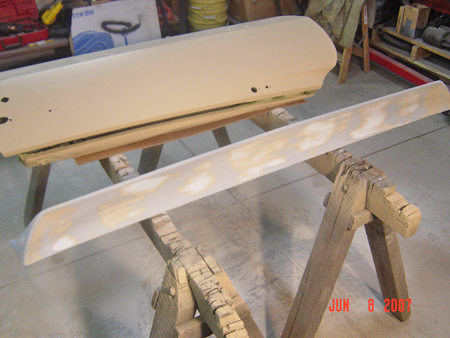 If you prefer power tools, sanding can be done with an air-powered DA (dual-action) sander set on grinding mode. Use a 6-inch pad. To smooth out those very minor scratches that you can just feel with your fingernail, go up to 180-grit DA sandpaper. The highest to go on a DA is 320- or 400-grit. That will help you to sand fine scratches that would take a long time to buff out. In addition to discs on a DA, you can use flap wheels to do small pieces. Final sanding with the finer grits of paper should always be done by hand with the paper attached to a sanding block. The block we use at home has slots at each end with nail teeth in them to attach the paper. More modern styles, such as many professionals use, are designed for more convenient stick-on papers. Jeff put his engine in after the car had been completely primed and sanded smooth, but not yet reached the final paint stage. 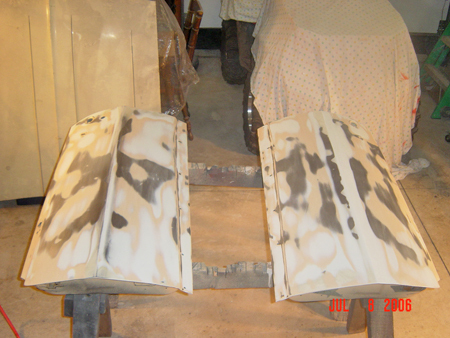 The final priming stage is an even more important step in the job of painting of your Resto-Mod. Your spraying equipment has to be super clean if you want to achieve super good results in the paint booth. Primers are relatively thick and heavy media and they should always be properly strained before you pour them into your spray gun. Use of the proper size spray gun tip is an absolute must. The tip's size controls the amount of material you'll be spraying. Test out the gun before you spray with it. Each gun has its own idiosyncrasies. Spray test paint using different air pressure settings until you get your spray pattern and material flow perfectly dialed in. Years ago, when new cars were sprayed by people, rather than by industrial robots, the automakers used to make factory workers with similar spraying techniques work the same shifts so both sides of a car would show "matching" paint application techniques. If the primer clogs your gun, you must clean it with acetone and start over again at the beginning. If the primer is mixed too watery, you'll get drips and runs in the primer. These must be fixed at all cost. If they occur, start completely over again. The primer must be absolutely smooth if you want the paint to be smooth. Climatic and temperature conditions can have a huge influence on the primer's drying time and dictate which product is best to use. Companies that supply primers can provide product tech sheets that specify what weather conditions should be when the product is used. Failure to read these sheets and consider the advice on them could lead to a poor finish and waste of resources. A clean and properly heated spray booth is also another factor to consider. It is important to keeping debris out of your booth so it doesn't wind up on your primer coat. The temperature of the booth counts, too. Check with your paint professional to determine which primer is right for your conditions. The final step is to apply the primer in a careful way, making sure to completely protect the car. Usually, three quarts to a gallon of primer will be required for each car. Resto-Mod builders debate whether the final primer coat should be sanded, how to sand it and whether or not it's OK to wet sand it for extreme smoothness. Conventional body shop wisdom—as well as many books—say that if you have block sanded the body surfaces twice and are confident they are flat, there really is no need to either block sand or wet sand the final primer coat. Not every builder agrees one hundred percent with this advice. Some argue that leaving the final primer coat "as is" meets body shop standards, but doesn't satisfy modern show car standards when you want to win an award or trophy. Some builders recommend using a 3M soft pad on a DA sander for final smoothening. They say 800-grit paper can be used with no issues. This arrangement gives you a glass-like surface if you don't linger too long in spots. Other builders feel comfortable wet-sanding (color sanding) the final primer coat when certain primers are used on the car. As many books point out, you should never wet sand lacquer-based primers. However, if a quality 2K primer such as Jeff Noll's Dupont URO Primer-Filler is used, wet sanding is not big deal because the primer is waterproof. Many builders don't see the need to smooth the final primer coat, but if you're using a good waterproof primer, it won't hurt and you won't need a sealer. Just check the product tech sheets to see if it's 2K. If it is and you want to try for ultimate smoothness, wet-sanding won't hurt. Wet sanding versus dry sanding is just a matter of personal preference. If you like wet sanding and don't miss sanding dust, then do it. Wet sanding tends to create a bit of a mess, but it is still easier to deal with than sanding dust. Many enthusiasts wet sand primer all the time without problems. They know that they have to clean the surface real good before shooting paint on it, so there is not much extra work and they feel they get a far smoother surface by wet sanding. "I really don't agree with not sanding my final primer coats," said one veteran who's painted cars for years. "Even I'm not so skilled that I can lay down a primer coat so smooth that it doesn't have to be final sanded." Another painter noted the job of wet sanding final primer goes even faster with finer grit papers. Some experts say that if you are planning on laying on some color coats, you should wet sand the final primer coat with 600-grit paper, rather than 400-grit. One admitted that he tried to get by with using 400-grit before apply the base color of a basecoat-clearcoat finish. After spraying on two coats of his base, he could still see sanding scratches. So he redid everything over, wet sanding with 600-grit paper the second time. After that, his re-shoot came out perfect. Another Resto-Mod builder prefers block sanding all primer coats and wet sanding the final one using a rubber sanding block or a paint stirring stickâ€”but not your bare hands! For curved sections, he uses the dense foam employed by shippers to support heavy objects. This can be cut into very nice sanding blocks. An important thing is to make sure your car is clean before you spray your topcoats. Wet sanding tends to leave dried and caked residue in every nook and cranny. You have to go over all of the areas where you have done wet sanding with a wax and grease remover and a blow gun to get it all the residues out. Sanding is boring, but remember that if you want a smooth-as-glass paint job on your car, sanding is the only way. Though it's not as exciting as spraying new paint, without proper sanding, the look of your car won't express perfection.